Alyssa wears many marketing hats at Showbie, from managing social media to overseeing the Showbie Champion program to designing marketing materials. Outside of work, Alyssa is a huge pop culture fanatic, likes to play video-games, and is just an overall nerd. If you like Doctor Who, she’s your go-to. #ShowbieAndTell aims at discussing edtech- and education-related topics with Showbie users and their fellow colleagues on Twitter. Thanks to all who participated in Showbie’s #ShowbieAndTell Twitter Chat on Tuesday, October 9, 2018! 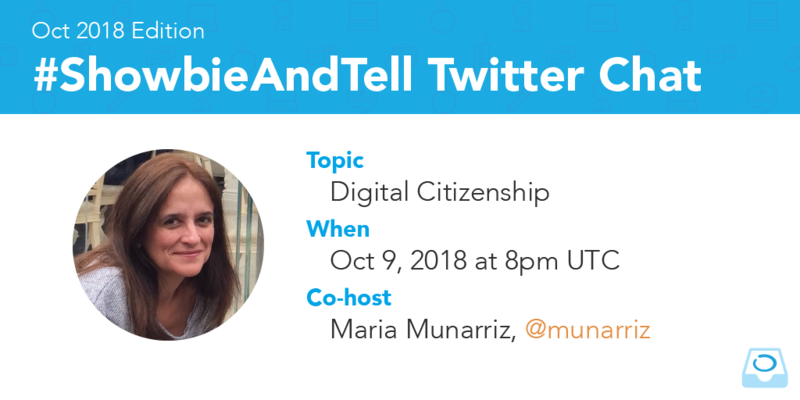 Showbie hosted a Twitter Chat with Showbie Champion Maria Munarriz around the topic of “Digital Citizenship”. Below is a curated version of the Twitter Chat with Maria Munarriz. How can we teach our students about lasting impressions their digital footprints can make? Why should classroom teachers care about student data privacy? What techniques do you use to teach your students about digital citizenship? What is your biggest challenge when teaching students to be more responsible as they use new technologies? If you’re on Twitter, you can see the full recap as a Twitter Moment here. Interested in participating in the next #ShowbieAndTell chat? Don’t miss out on connecting with like-minded educators like you!